Saving money is not easy for families who dine out often. But that doesn't mean cutting out restaurants completely. You'll find many affordable items on the menus of restaurants that are geared toward the budget conscious family. If it's been too busy of a day to cook, or you just want a meal out, Charlotte, North Carolina has a good selection of restaurants that offer free (or very cheap) food for kids on every single night of the week: Sunday, Monday, Tuesday, Wednesday, Thursday, Friday, Saturday. Some restaurants in Charlotte offer one child's meal free per one adult dinner. Almost all of these promotions are for dine-in only and require an adult meal purchase with a dollar amount usually specified. Some restaurants offer very reasonably priced children's menus every day. If a restaurant doesn't indicate an age for their children's promotion, it's reasonable to expect that the offer applies to children 12 and under. Generally, it is always best to call the restaurant ahead of time and verify the offer before you pack the kids in the car. Promotions are changing all the time and special offers may be time-limited. These Charlotte restaurants offer children's menus and free meals for kids in a family-friendly setting. Duckworth's is known for its cheesesteak sandwiches and craft beer menu. Although they tout their beer offerings, they are family-friendly and have a reasonably priced children's menu. Duckworth's offers Kid's Eat Free meals on different nights at different locations: Ballantyne is on Tuesday and Thursday, Huntersville is on Thursday, and Mooresville is on Sunday and Monday. 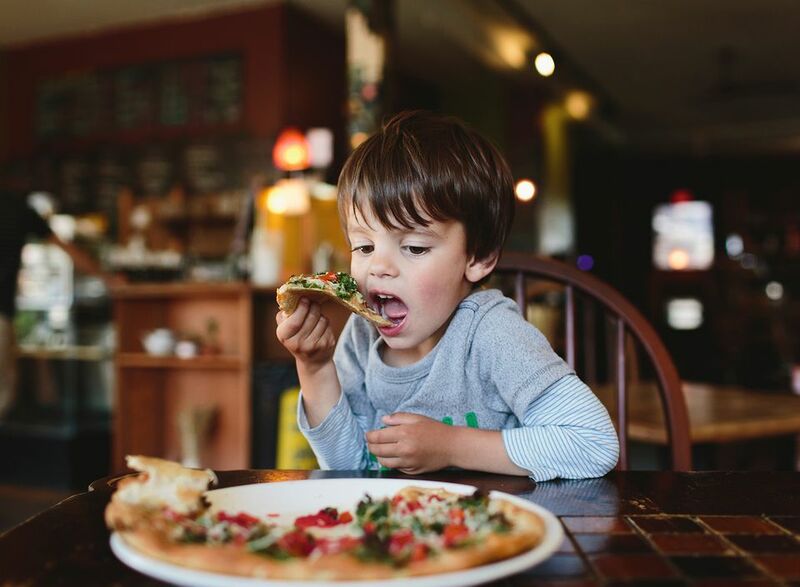 Their Uptown and Park Road locations do not have Kid's Eat Free nights. There are some restrictions. The offer is limited to one free kid’s meal per $12 in adult purchases (limit one child, age 12 and under, per adult). Families can take advantage of the deal for dine-in only. The offer cannot be used in conjunction with coupons or daily special items. Thai House serves typical Thai fare, including pad Thai, fried rice, and curry. This family-run Thai restaurant is decorated with Thai artwork and hand-made teak wood pieces. To complete the cultural experience, you'll hear Thai music as you dine. Kids under 9 years old eat free with an adult entrée purchase. Hwy 55 serves burgers, shakes, and other American classics in a 50's style diner atmosphere. The kids will love the colorful booths and the amazing desserts like the piled-high banana split. If you're there on the right day you might catch a cruise-in of classic cars. Their children's menu includes such favorites as hot dogs and grilled cheese sandwiches. On Tuesdays, they offer one free kid's meal per adult meal purchase. The Grid Iron is a family-owned restaurant that specializes in steak, seafood, and Italian dishes. Their cozy restaurant is on one side with a sports bar with 18 large-screen TVs on the other side. On nice days, you can eat outside on their small patio. Every day, children under 10 years of age eat free from the children's menu with the purchase of an adult entrée. There is a separate kid's menu for breakfast, lunch, and dinner. In addition to typical kid's fare like grilled cheese sandwiches, the dinner menu lists cheese ravioli and penne pasta as options. Golden Corral is a well-known chain that serves all-you-can-eat buffet food for an affordable price. Diners choose from over 150 items including grilled-to-order sirloin steaks, pork, seafood, and shrimp alongside traditional favorites like pot roast, fried chicken, meatloaf, mashed potatoes, macaroni and cheese, Bourbon Street chicken, fresh salads, their famous yeast rolls, and new smokehouse offerings. All day every day, children under three years old eat free from the buffet with the purchase of an adult meal. Children 4 to 8 years old eat for $5.99, and kids ages 9-12 eat for $6.99. Dilworth is a popular sports bar that also has a large patio area for outdoor seating in the summer. Their "Build Your Own Salad" made with fresh produce and a choice of seven house-made dressings is popular. Spiedies meat sandwiches, an upstate New York favorite, is on the menu along with spicy shrimp and carne asada tacos. The health-conscious will enjoy the grilled salmon. The children's menu offers foods like cheeseburger sliders, penne pasta, and pizza. Kids eat free Monday through Thursday—two free kids' meals per adult entrée purchase. Captain D's is a seafood restaurant that offers fresh fish platters and finger food. On Thursday, get two free kids' meals with any adult entrée purchase at regular price (dine-in only). They have a children's menu that includes fish and chicken tenders as well as popcorn shrimp. Please note, not all locations participate in the free kids' meals—please check with your local Captain D's for details. Big Tiny's is an authentic Texas-style barbecue restaurant located in Mooresville (part of the Charlotte Metro area). With specialties like smoked beef brisket dinners and peach cobbler for dessert, Tiny's pleases the traditional barbecue lover. Family Meals for four include barbecue, four sides and a choice of bread. Kids 12 years old and under get a free Kids Combo Meal after 4 p.m. on Thursdays. One child per $10 adult entrée. O'Charley's features old-fashioned southern comfort foods like chicken pot pie and southern fried chicken. In addition, they have steaks and salmon along with a weekly prime rib special. At participating locations, kids 10 years and under eat free from the kid's menu every day with the purchase of an adult entrée. The children's menu includes things like grilled chicken, corn dogs, and shrimp. Pure Pizza is a community-oriented local restaurant touting a "healthier pizza using farm-fresh ingredients." They offer salads, pizzas, calzones, and desserts. Kids 12 years old and under get a free Kids' Meal all day on Thursday. One child per $10 adult entrée.